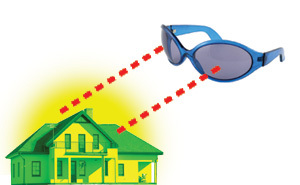 Can you imagine what it would be like if you had a pair of special “x-ray” glasses that would make any house in your town glow bright green six months before its owners were thinking of putting it on the market? That would be one cool set of glasses wouldn’t it? I bet if you had a pair of those glasses you’d drive around your entire town, and take careful note of the address at homes that glowed with this special green. Before long you’d probably train someone else to drive around town all day and write down the addresses for you. What would that list of "soon to be home sellers" do for your business? It would certainly be upsetting to that agent who’s always “owned” the neighborhood when you start scooping all the good listings right out from under them! Listing-Getting System in different markets across the country (and in Canada). And in every test market we’ve been able to identify future homesellers for less than $20. Earlier this year I shared this program on a first release basis with 99 people. The class sold out instantly, and the results have been amazing. The amazing thing is to watch the results unfold before your eyes. It starts out with the results people get from sending out the postcards – and then to appointments – and then to listings – and finally to sales! All within less than 90-days. In fact, Chuck Charlton from Milton, Ontario won the prize for the fastest listing and sale in the class … about 45 days from sending out his first postcards. In session 4 Chuck shared exactly what happened. This series outlines the complete turn-key system I’ve been quietly perfecting over the past 18 months. In each module, I lay out in precise detail every step, and provide every tool you’ll need to take over any farm area or neighborhood you choose. This is where it all starts. I’ll share with you a completely turn-key system for getting all the listing leads you want. Once you identify future homesellers – it’s all about making sure they choose YOU when it comes time to put their house on the market. PLUS – A turn-key one year follow-up system including 12 customizable newsletters and 12 cover letters written especially for homesellers to position YOU as the only choice to sell their home. Once you’re doing everything we talked about in modules 1 and 2 – you’ll start getting people calling you to “come over and talk” about selling their home. The only good listing is a SOLD listing. The quicker the better. If the very best kind of listing is a “SOLD” listing – the very best kind of buyer is your own buyer! How to put the complete program on autopilot – and run it from the beach! You also get access to a private “Members Only” password-protected site where you can download all the class materials, the ads, postcards, letters and other tools we’ll be using to get you more listings. Let’s say whenever you sell a listing you make an average of $5000. In your area it may be more – may be less – but that’s a pretty good national average. If you could generate listing leads for less than $20 each (our national testing average was $16.66) it would cost you less than $2000 for 100 listing leads. Now – how many of those would YOU be able to convert to listings? This Listing-Getting System could easily be worth thousands of dollars for you. My prediction is that 20% of the people who participate won’t do a thing… and that 20% of the people will take this system and really run with it. That’s what I’m looking for. The Top 20% who will totally transform their business and use it to make hundreds of thousands of dollars next year. You can't go wrong with Dean Jackson's Getting Listings class. Where else can you generate leads of prospective listings before any other Realtor knows the homeowner is thinking of selling. It is truly like flying over a neighborhood and the homeowners who are thinking about selling have their homes lit up with neon signs saying "come list me." Dean is the guru of generating leads. He blows me away w/ all his great ideas. If you put every idea to work that is taught in this class the results will astound you. Even if you just mail the post cards to 1 neighborhood it's worth the price of the class. Just think if you add more neighborhoods, classified ads for buyers and sellers and a buyer website. You'll be dominating your market in a short period of time. When Dean is on your team scarcity goes away. You can pick the cream of the crop!!! Getting Listings is pure genius, you just have to be smart enough to follow the step by step instructions. This system will make you the listing specialist in any area you desire. Dean gave us tons of tools to use - things that most realtors don't have - or don't use if they do have. Things that are so simple but so effective. He gave us action plans and templates for ads and scripts for hotlines and . . . One of the most important things I got out of the class was a change in mindset. From "How can I get this listing" to "Do I really want this listing?" - In other words, I'm interviewing the Sellers to see if they are a five star seller as opposed to the focus being on them interviewing me. And if they are five star - then the tools Dean gave us help us to "WOW" them and exceed their expectations. Thanks, Dean, can't wait to get mine started! Thank you for a great teleclass. Dean, you are very knowledgeable teacher-leader-instructor all in one. I was quite skeptical in the beginning of our teleclass fearing another general knowledge course and no substantial result; that is history now. Tools what you provided for us are incomparable. Once the system is in place - it requires very little work. This is something that all agents are looking for. Plus it eliminates COLD CALLING and still be able to stay in business. This class was worth every single penny and if you offer another class - I'm in. Actually, I just signed up for your March class. In a word (or two), DO IT!!! Do it now and don't overthink your decision. Seriously, I've used Dean's products for close to 2 years now. If I haven't learned anything else I've learned that his methods are well thought out, well put together, well tested in various markets, and more importantly they work and work well! It really is that simple! I'm in an office of 145 agents and in a local company of 800 agents in Greater Cincinnati. Our company is still teaching passing out flags, pumpkins, and flower seeds to "get your name out there". Dean teaches "get their name in here." They ALL spend 85% of their time looking for new business, most of the time out of desparation.. With Dean's turn key programs, I spend 85% of my time following up and "tipping out" leads to my team. It truly is a volume knob for prospects that seek me out to become clients. 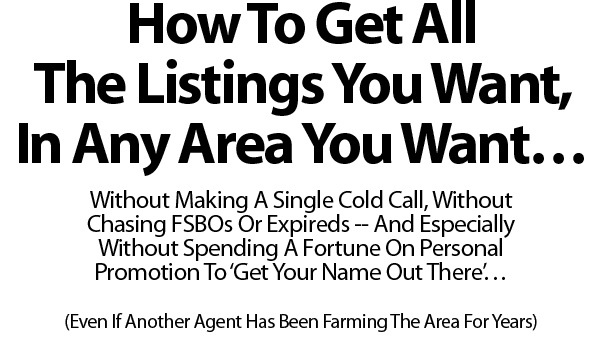 It's a very interesting position to be in when 12 dozen agents ask, "Where do you get ALL your leads?" Dean makes real estate FUN! FYI. Thanks so much. The getting listing program has saved my real estate career! ps. I now have 2 listings because of this program and the buyers are coming in like I have never seen before. © Copyright 2005- NewInformation!, Inc. All Rights Reserved.